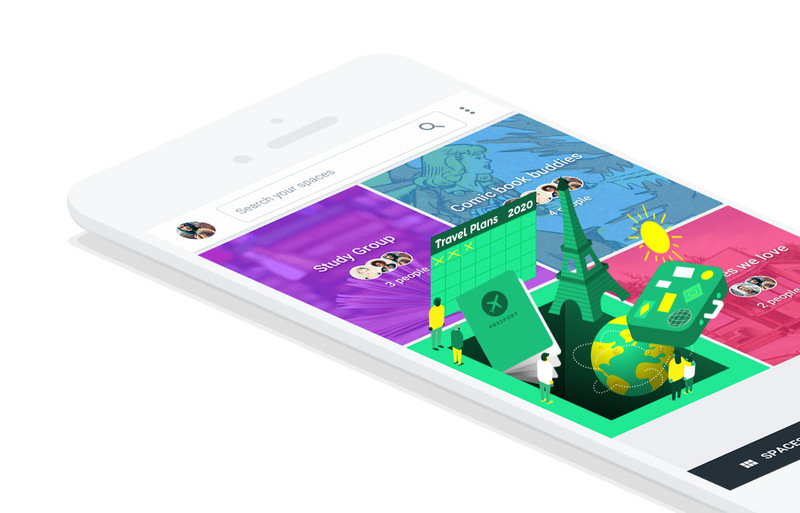 To kick off Monday, Google went ahead and gave us a new app to try out, called Google Spaces. As the name sort of suggests, it’s a bit of group messaging or sharing app that revolves around specific “spaces” or topics that you’d like to discuss with friends or family or co-workers. Google is calling it a “better group sharing experience,” so again, the goal is to get you sharing information with others about topics. Did we need an app like this? I don’t know! With Spaces, which we are still waiting to go live on Android, iOS, and Chrome, Google has built-in Search, YouTube, and Chrome to allow you to find items (like videos or web pages) to be shared and then quickly searched through to find other or older items too, perhaps mentioned topics deep in the past of a Space. In the screenshots currently available from Google, they are suggesting spaces for topics like group trips to Paris, study sessions with fellow students, a comic book club, kitchen remodels, a space for college buddies to bro-out in, or parenting tips. It’s not a difficult idea to understand, right? You have this app for sharing topics with others who have interest in a topic. If you are attending Google I/O, Google says to install Spaces because they plan to create a space for each I/O session so that “developers can connect with each other and Googlers around topics” at the conference. Once Spaces goes live, we’ll be sure to share those direct links to Android and iOS. For now, feel free to cruise around the Chrome landing page and preview some of the fun. UPDATE: Google Spaces is now live!